It's that time of the month again .. favourites time! I cannot believe we're already a week into August! WHERE IS TIME GOING? As you read this, I am currently on holiday in Majorca in the sun topping up my tan, but today I thought I'd share with you some of my favourites for the month of July! 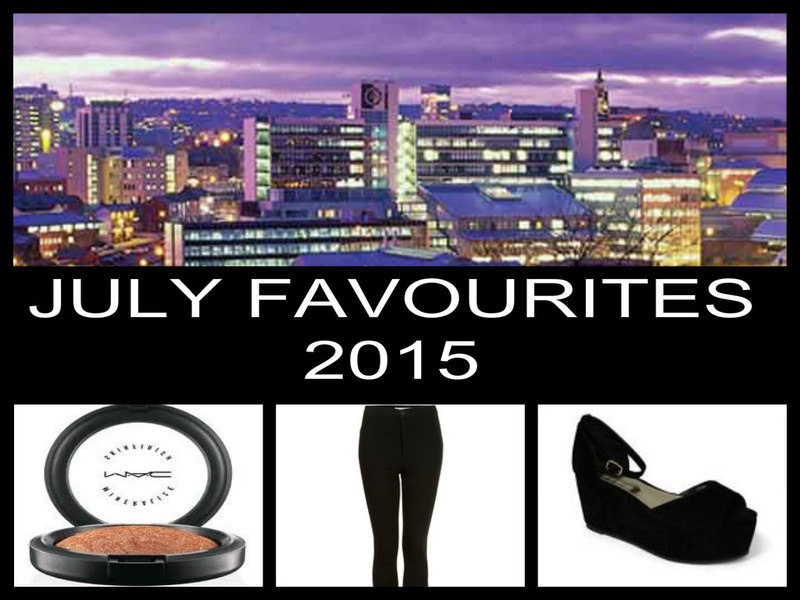 My absolute favourite things about July has got to be Sheffield! I was able to spend 2 weekends there and we also got the keys for our new flat for final year of Uni. I love Sheffield and I had so much fun on both occasions with everyone! My second favourite thing in July was my Placement. Unfortunately my placement year finished at the end of July and I'm honestly gutted to have left! I found it difficult at the start but overall I really enjoyed it and everyone who I worked with made me feel so welcome! I can't believe it's over! When I went to Sheffield for my boyfriends birthday night out I wore my new Primark Flatform Heels. They're so comfortable and I don't look taller than him which is a bonus. I'm obsessed with my MAC Mineralise Skin finish in Gold Deposit at the moment. My friend and I were using it none stop when we went out in Sheffield and it just made our skin look so glowy and radiant. I can't wait to wear it on my holiday! Whilst I was on placement I wore my Black Joni Jeans none stop. I have been loving jeans at the moment and I just love the fit of them. The only thing I dislike about them is the quality. I think for £36 a pair, they do fade quickly (especially the black ones) and they also wear and tear too. My final favourite this month has been the song wings by Birdy. I have literally been obsessed with it. It's quite an old song but I recently heard it on an advert and have been loving it ever since. If you've not heard it I recommend checking it out HERE. What did guys love in July? Let me know any products/clothing items you'd recommend!